Luxury watches, 560PS on four wheels and a real fighter jet: We brought together what sounds like the incarnation of every man’s dream for a Duel on an airstrip in Switzerland. Oris –Swiss made watches has been a sponsor of the Swiss Hunter flyers for years. 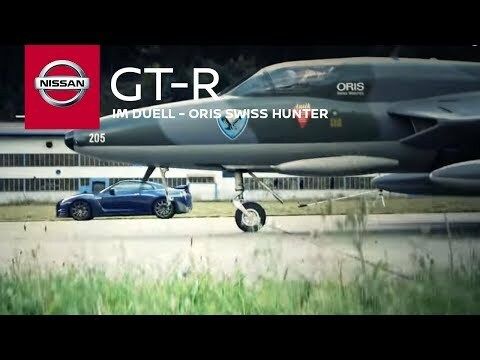 We plan an exclusive race between the new Nissan GT-R and an Oris Swiss Hunter Fighter jet and produce an elaborate cover story for the N-magazine with worldwide distribution. A fascinating video of the race weekend, following the dual and documenting the clear winner becomes a Youtube hit with over 500,000 views.